Finding the best food dehydrators and figuring out which one is going to suit your needs best can be a tough challenge. There are numerous options and it’s impossible to try them all before you buy. This is why food dehydrator reviews are so important. Learning information from someone who has tried several food dehydrators allows you to analyze what’s available and make the best decision for you based on what experienced users have to say. Understanding how a food dehydrator works can help you make a better selection when you’re shopping for one for your home. This is a basic overview of how all models operate and can help you get a feel for what to look for in a food dehydrator. Food dehydrators remove the water content from food. This helps to preserve foods that are typically considered perishable and gives them a different taste and texture. You can also add spices during the dehydrating process to alter the original flavor of the food even more. When water is removed from food it cripples the bacteria that would normally work to spoil the food. Prior to the invention of mechanical dehydrators, people would preserve their food by laying it out in the sun. This method worked in most cases, but it took time and wasn’t exactly predictable. Humidity and overheating the food could be a problem and if the weather changed drastically mid drying process, the food could spoil. Not to mention the risk of putting meat and other food out into the open where animals can gain access to it. The best environment in which to dry food is one that is consistent with air circulation and temperature and that temperature should be low and even. Using a mechanical dryer allows you to control the unpredictable factors you’d face when dehydrating food naturally. Food dehydrators allow you to work with a variety of different foods. Some of the most common include beef, fish, poultry, fruit, vegetables, and spices. Even if a dehydrator is labeled as a “beef jerky dehydrator” or “veggie dehydrator” it usually works the same as other dehydrators and you’ll be able to use it for more than just the specific item on the label. When dehydrating food, you’ll notice they change in color and texture. They might not even look as “appealing” as they did when you put them into the dehydrator. This isn’t a problem because even wrinkled, dry food can taste delicious. And because this is actually a method of food preservation, it is possible to later rehydrate the food with water. Many people dehydrate ingredients and later add water back in to create a delicious meal. For instance, vegetable soup can be dehydrated and packed for a camping trip to make it lighter and smaller to carry and then you can add water once you arrive at your destination and you’re ready to prepare your meal. Dehydrated fruit and veggies might be chewy, crispy, or crunchy after you’ve completed the drying process. Meat tends to be cheesy, though there might be crisp edges. 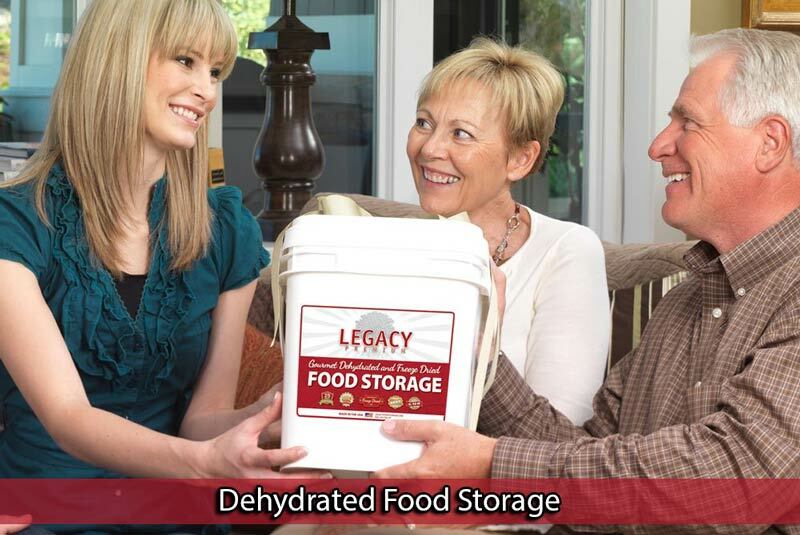 Dehydrated foods last a very long time and can be easily stored because they are easy to package and take up very little space. Dried foods make for great travel snacks and can allow you to extend the life of healthy, perishables far beyond their usual season of freshness. Our list of the best food dehydrators includes some of the most popular brands on the market. We chose options that work for experienced food dehydrators and for those who are new to dehydrating. We also took into account price, availability, size, and performance. Our goal is to help you find the best make and model for your needs. In general, our picks for food dehydrator reviews include the Nesco Food Dehydrator and Excalibur Food Hydrator. The Nesco is great for making average size batches of food, while the Excalibur has a timer, so you can “set it and forget it.” Other options we love include the Ronco Food Dehydrator, the Presto Food Dehydrator, and Cabela’s Food Dehydrator. Nesco is one of the most well-known brands in food dehydration and small kitchen appliances. They are known for their reliable, high-quality products. They are also considered an affordable option and offer dehydrators in a few different price ranges. Our choice for overall best food dehydrator is the NescoSnackmaster Pro. It’s perfect for dehydrating average batches of food and comes with five trays. You can add an additional seven trays if you want to produce bigger batches. The thermostat on the NescoSnackmastercan be adjusted from 95 to 160 degrees and there’s a top mount fan that sends air downward and horizontally so food dries as efficiently and quickly as possible. The Snackmaster express food dehydrator comes standard with two solid liner sheets that enable you to make fruit rollups or to dry sauces and other liquids. There are also two mesh sheets for food and three packages of spice for adding to jerky. This dehydrator does not come with a timer, so you’ll need to be close by when it’s time to switch off the machine. Another model from Nesco we liked is the Gardenmaster Food Dehydrator. It comes with fewer trays than the Snackmaster Pro, but you can add trays the same as you can on our favorite model. The Gardenmaster offers adjustable temperature control from 90 to 160 degrees, so there’s a slightly larger range than with the Snackmaster. This model comes with a top mount fan and it does have a timer that can be set for up to 48 hours. It features one screen and one fruit roll-up sheet. You can get a Gardenmaster in a larger size for a higher price point and it comes with two additional trays, as well as three fruit roll-up sheets, three screens, a jerky gun, and six packets of jerky spice. 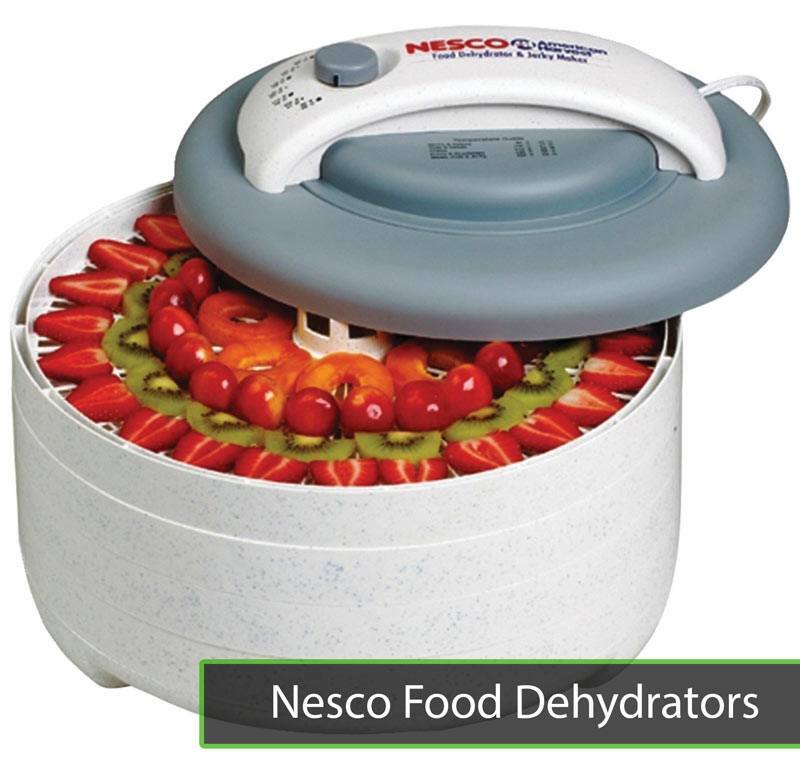 Another model we believe belongs on our list of best food dehydrators is from Nesco FD-75-A. It’s another of our favorites from this brand. It features a top mount fan and has an adjustable thermostat that ranges from 95 to 160 degrees. There is 4.6 square feet of drying space. This Nesco model tends to be one of the most budget-friendly available and we consider it one of the best values on this list. One of the features we like about this model is that it is expandable so you can add more trays. This allows people who just got started to dehydrating to start with a small to moderate sized dehydrator with just five trays and upgrade with tray additions as they become more experienced and dry larger batches of food when you are just learning to dehydrate food. You can eventually add up to 12 trays. The FD-75-A doesn’t have a timer and it automatically turns on and off when it’s plugged in and unplugged. This dryer has a quiet fan and can be running in the background with very little noise or interference with your everyday life. We love that it’s lightweight, so you can store it away and bring it out when you’re ready to work. The trays are dishwasher safe and BPA free. The entire unit is not BPA free, but the primary surface touching your food is. Another thing that’s a bonus when you buy a Nesco is the fact that there are so many great accessories you can add to your dehydrator. The brand offers a wide range of products including jerky guns, fruit leather trays, and other items, so you can start with a basic model and upgrade as you learn more about dehydrating. 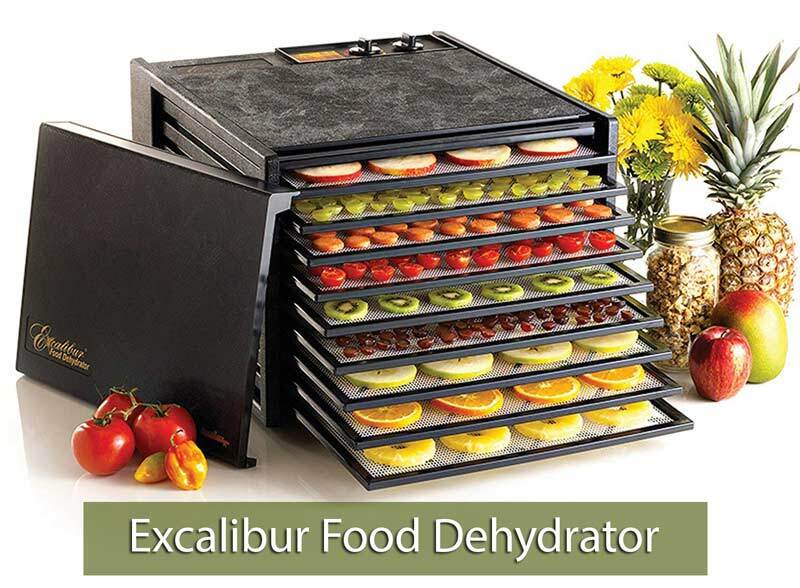 Our next choice for best food dehydrator comes from the brand Excalibur. It is the Excalibur 3926TB. It’s a top food dehydrator and uses a horizontal airflow for drying which we found produces even drying results. It features plenty of drying space with nine trays, so it’s bigger than a smaller six tray food dehydrator. That’s 15 square feet of drying space, which makes it great for larger batches of food. This capacity allows for up to 5 lbs. of potatoes in a single drying cycle. It’s also easy to fill with food. With the trays out, we have also found this best-rated dehydrator to be an excellent place to proof bread. Trays feature a non-stick screen which makes them perfect for most kinds of drying. There are also several drying sheets available that allow you to make fruit leather or dry sauces and other liquids. The thermostat on the Excalibur ranges from 105 to 165 degrees, which is on the higher end so it’s great for jerky. The dehydrator features a 26-hour timer so you can dry food overnight or while you’re away doing other tasks. There’s a fan located in the back of the model that circulates air evenly. One of the things we liked about this dehydrator is the ability to move around or remove trays so you can dry taller, thicker foods. This also makes it possible to proof dough or warm rolls or bread. It’s even possible to cultivate yogurt in this model. Keep in mind, this model is larger than the other options on our list, so if you’re concerned about space it’s not the right choice for you. We’d recommend this food dehydrator for the more experienced dryer who is committed to this type of food preparation and can allot a decent amount of space to equipment in their home. This is a completely BPA free dehydrator (not just the trays). Like some of the other models on this list, it offers a wide range of accessories, including a clear door, dehydrator sheets, and many other items. The Excalibur dehydrator features an impressive 10-year warranty. The only faults we found in this Excalibur model is the noise of the fan and the power with which it runs. A powerful fan can be advantageous in a food dehydrator, but it also tends to blow around lighter items like dried herbs. 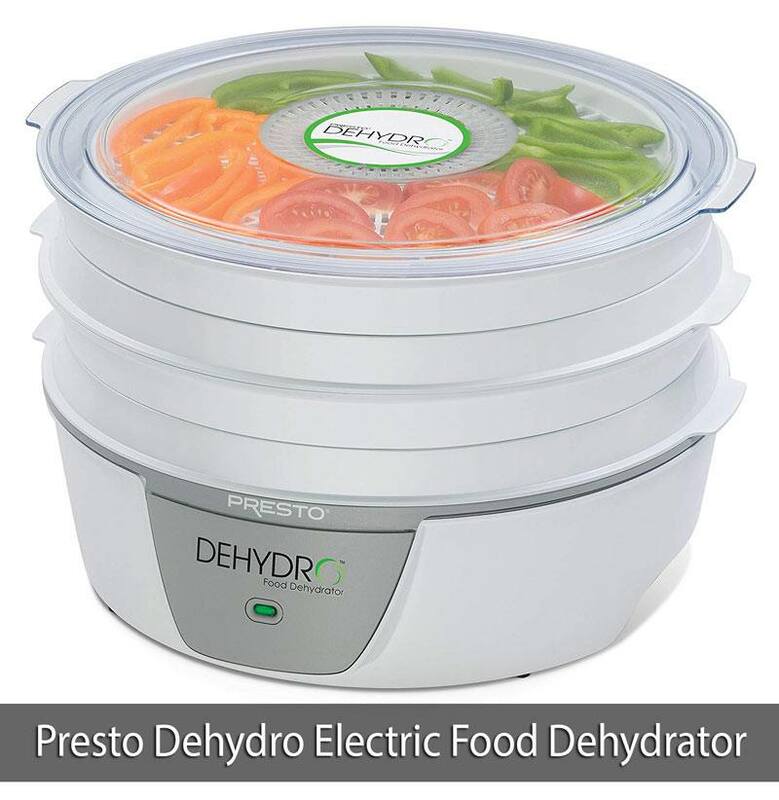 Presto’s Dehydro Electric Food Dehydrator is perfect for those who are new to food dehydrating. It offers small-batch dehydrating and comes standard equipped with four trays. It is possible to expand its dehydrating capacity up to eight trays. The fan in this model is located at the bottom, which means we had some trouble with juice dripping down into the fan as drying was in process. We found it to primarily be a problem when we tried dehydrating fresh fruits and vegetables. The temperature on this model consistently operates at 165 degrees. There is no timer, so you’ll need to be nearby to turn it off when a batch of food is done drying. The Presto dehydrator does not come with mesh sheets or fruit roll sheets but you can buy them separately. The trays that do come with the model nest inside to provide for compact storage. One of the things we liked about this dehydrator was its clear top that allows you to peek inside while the food is dehydrating. This makes it a fun option for those who want to try dehydrating food as a family and allow their kids to see the process in action. 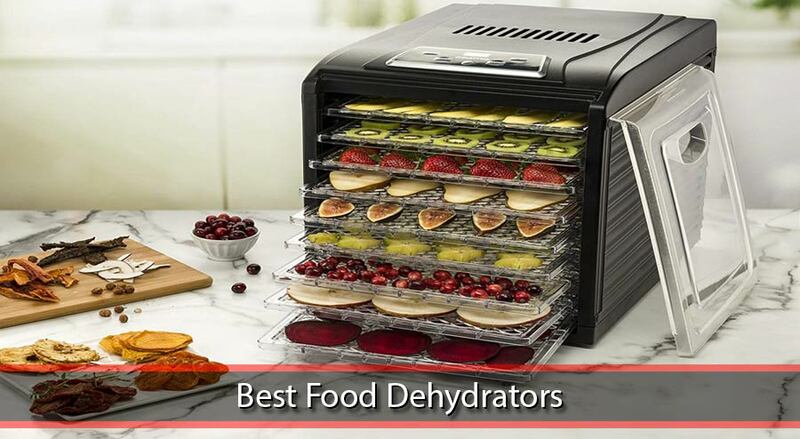 We like this dehydrator a lot for those who are new to the process, but we don’t think it would be right for the more experienced in food dehydration. However, if you are looking for a second unit or a unit you can travel with, we think this one would be a great option. 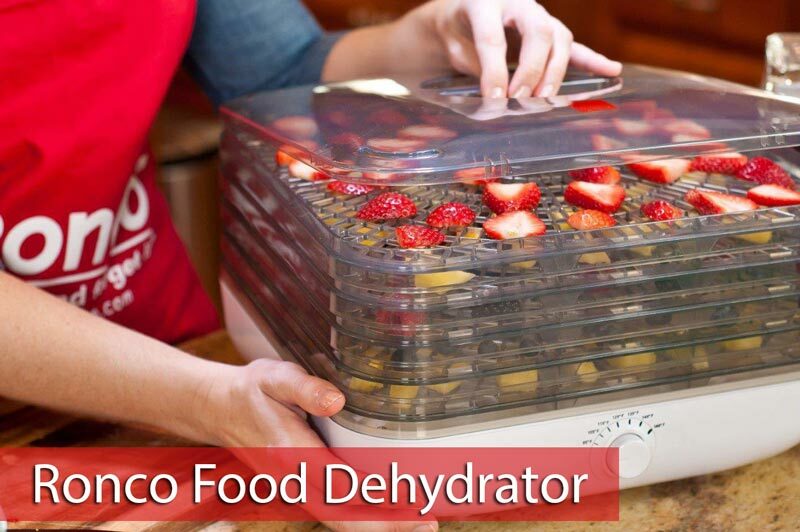 Ronco is another of the best-known brands in food dehydrating. The Ronco EZ Store Turbo 5 Tray Food Dehydrator is the model that makes our list of best food dehydrators. It’s an affordable option that features a good temperature range and is easy to clean. It’s one of the smaller models on our list, but if you’re looking for something that isn’t too big this is a great option. This food dehydrator is known as the best value on the market because it’s at one of the lowest price points you can get a quality dehydrator. It’s the perfect entry-level dehydrator, but probably wouldn’t be right for someone with a lot of drying experience. We’d recommend it for a first-time buyer, but not for someone who is replacing their original machine. The dehydrator features five square trays that make it easy to place food and it’s considered one of the easiest dehydrators to clean. The high ease of use ratings is another reason why it’s a great option for newcomers to food dehydrating. There are a few downsides to the Ronco dehydrator. It doesn’t feature a timer, so you need to be nearby to shut it off at the end of the drying time. It uses vertical airflow which some more experienced dehydrators don’t consider ideal. It also tends to be noisy. Some users have also criticized this model for featuring too little space between the trays. This can not only make it tough to work with, but it also tends to increase drying time. There is no temperature gauge, so even if you adjust the temp to made up for the crowding you have no way of knowing if the internal temperature is accurate. All in all, even with some criticism, we think this is a great basic dehydrator for those who are just getting started on their food preservation journey. 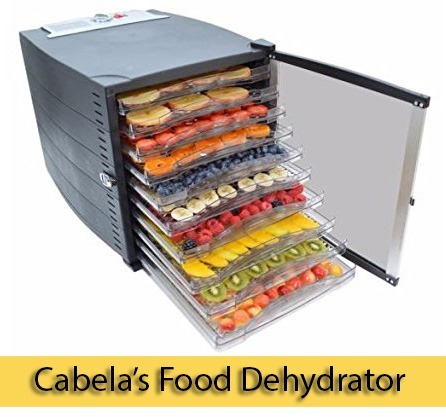 Cabela’s Food Dehydrator is one of the more sophisticated options available. It makes dehydrating easy because it can monitor air intake and temperature in the unit. 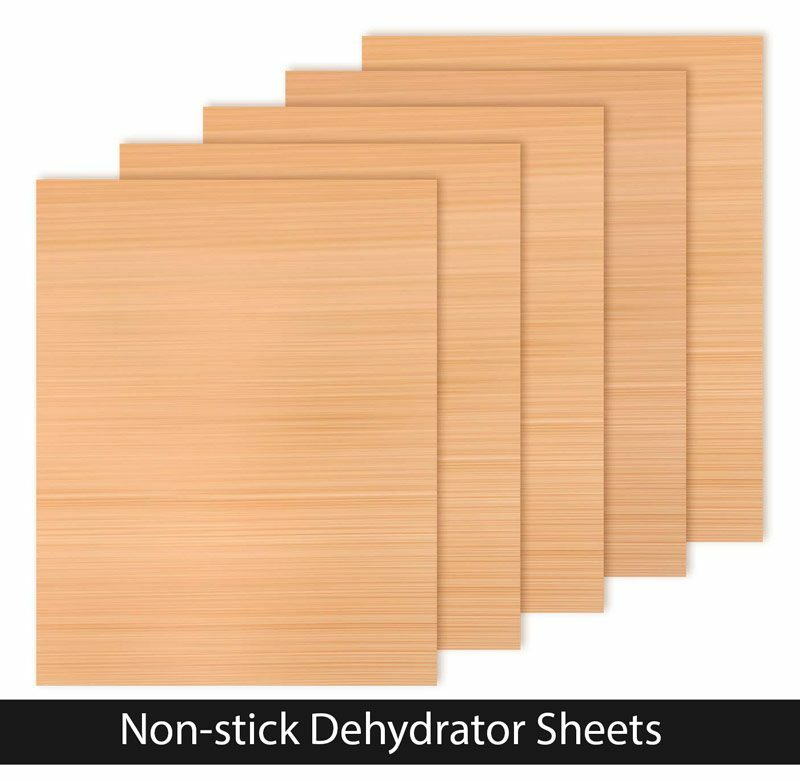 It’s a pricier option and tends to be on the bigger side, so we might not recommend it to those who are new to dehydrating. This dehydrator features a bright, easy-to-read digital display that allows you to set drying time and temperature. It comes with 12 drying racks. The Penta 360-degree Air Flo and the SmartHeat function both ensure you’ll get even and consistent drying results. It has one of the widest temperature ranges available on our list of best food dehydrators from 80 to 160 degrees. The timer can be set up to 23 hours and 55 minutes so, at the most, you’d need to reset one time within a day if you need to dehydrate for longer than that. The downside of this dehydrator is its size. It’s fairly bulky, which makes it tough to store on your countertop though doing so is usually possible. Among the best food dehydrators, this is one of our favorites for a few reasons. It’s pricier, but it’s still a good value. You are getting a high-quality product and it comes from a reliable brand. Even if you are new to dehydrating, this is an investment you can make and feel good about. And you won’t need to upgrade to a larger dehydrator in the future when you are a dehydrating veteran. We used each food dehydrator we tested for up a minimum 24 hours and dehydrated at least one batch of food. A variety of different foods were dried, including fruit, meat, and vegetables. We evaluated the most important features on each dehydrator, including quality, size, ease of use, capacity, efficiency, and more. If you’re shopping for a food dehydrator there are several things you should consider. Investing in a larger capacity dehydrator can prevent you from having to upgrade down the road in your dehydrating “career,” but larger models aren’t for everyone. You need to consider how much space you have, whether or not you want to travel with your dehydrator, and how much food you intend to work with at a time. We also think consistency is important. This is always true, but it can be especially important when you’re new to dehydrating and you need to get a feel for how it works and what the end result is supposed to be. Models with higher numbers of trays tend to offer the best consistency because they allow the food to be spaced out as much as possible and allow for even drying. If you’re interested in drying meat and making jerky, you need to make sure in advance that the dehydrator you choose is capable of drying meat safely. It has a higher risk of spoiling than fruits and vegetables, so you need to work with it carefully. It’s also a good idea to opt for one of the models that have a timer and a built-in digital thermometer so you can monitor the internal temperature. Dehydrating meat is a little more complicated than dehydrating produce, so you’ll want to consider a dehydrator with a few more bells and whistles if you plan to concentrate on animal proteins. Most people want a BPA free dehydrator, which some of the choices on our list are, at least in part. More and more people have come to understand the risks that are associated with products containing BPA and when you’re placing food directly onto a plastic surface and heating, it’s better to be safe than sorry when it comes to chemical exposure. BPA dehydrators tend to be labeled as such. Buying one that is completely BPA free can be more expensive than a machine that just has BPA trays, so if you’re trying to balance safety concerns with your budget, you might want to take this into consideration. Do you want a small dehydrator or a large dehydrator? Small dehydrators tend to be better for beginners and for those who don’t have a lot of space to work. They also work great for backup or travel dehydrators. Larger dehydrators take up more space, but they allow you to work in bigger batches.So, overall, you’ll invest less time in the process and get more food. Most food dehydrators, even those that are on the larger end of the spectrum, tend to be able to fit on a kitchen counter unless it’s a commercial model. 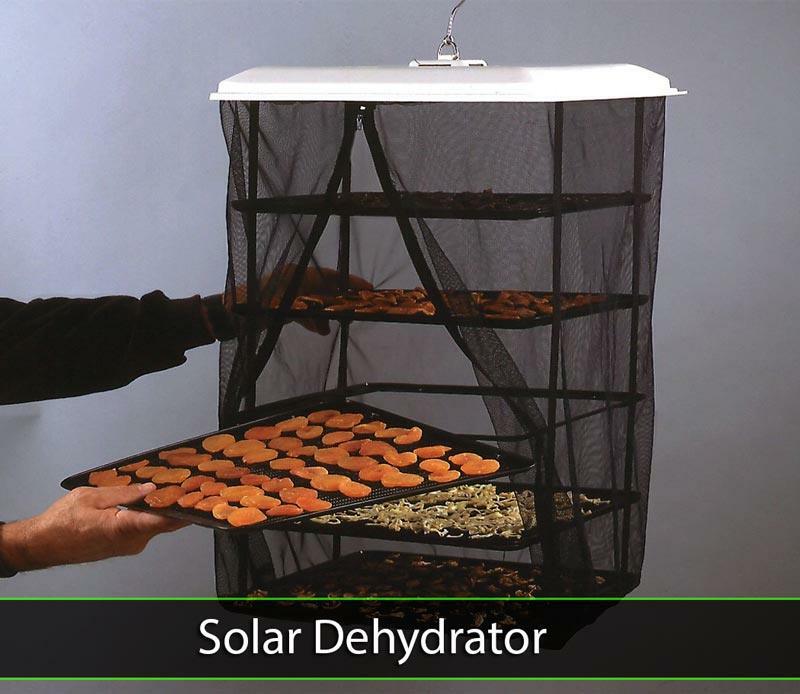 Do you want a solar or electric dehydrator? Electric dehydrators are the norm, but people are switching to solar. This is especially the case if they intend to use their food dehydrator while traveling and intend to be involved in an outdoor activity, such as camping. Solar dehydrators have the same risks involved as the original dehydrating methods that utilized the sun. They offer a basic method of drying food, but are unreliable and produce uneven results with little ability to control the drying process. Keep in mind that not only do you risk not having a quality piece of dehydrated food with a solar dehydrator, you’re also putting the health at risk of anyone who consumes the food because improperly dehydrated foods can lead to illness. Do you want an industrial dehydrator or a home dehydrator? Most people who intend to dehydrate food at home will do just fine with this type of dehydrator, but if your intention is to dehydrate huge amounts of food or you’re dehydrating for several families, it might be worth investing in an industrial dehydrator. They are very large and cannot sit on a countertop. Most people who have an industrial dehydrator at home set aside space in their basement or garage for the machine and for working. Do you want horizontal or vertical drying? Food hydrators can operate horizontally or vertically. Horizontal airflow dehydrators have fans and heaters on the side, while vertical airflow dehydrators have them on the bottom. There are pros and cons to both. For instance, horizontal machines tend to offer more even heat distribution and can handle larger batches of food. They’re also more expensive, tend to be noisier, and require larger spaces for storage. Vertical airflow dehydrators cost less and require less space, but they are typically known to provide less predictable and the racks need to be rotated during the process to prevent uneven drying. Some people also experience issues with vertical dehydrators dripping onto the heating element or fan at the bottom, which means that fruit leather trays are an absolute necessity if you have a vertical dehydrator. Dehydrators often have the space to accommodate additional trays, even if they come with a standard amount. Adding trays allows you to dehydrate greater volumes of food at a time and they are one of the most common accessories people invest in once they’ve purchased their dehydrator. It might also be possible to upgrade to BPA trays if your original model did not come BPA free. For many, this is a way to reduce their health risk and make their dehydrated food healthier without investing in a whole new dehydrator. 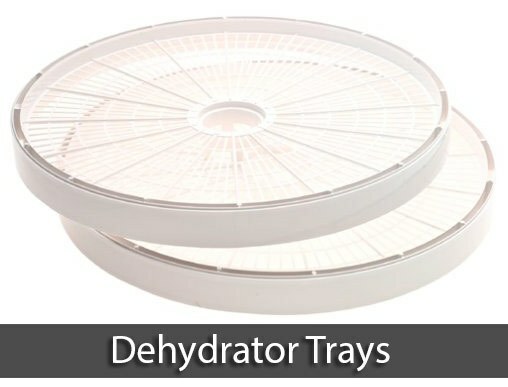 In addition to additional trays, you can also purchase trays that are intended for dehydrating specific foods. For instance, fruit leather dehydrator trays are a great way to make fruit leather and copy the less healthy “roll-up” snacks you can buy at the store by making them with just a single ingredient. You make fruit leather by pureeing fruit and then spreading it onto the drying tray. Because it’s a liquid, unlike unpureed fruit, a typical drying tray won’t work because the liquid drips to the area below the tray. Another addition to your collection of dehydrating tray accessories can be trays specifically designed to help youto dry herbs. You can also use fruit leather trays for this. The holes in these trays tend to be smaller and prevent liquids and small herb pieces from falling through. The holes that are used to allow air to circulate to the foods being dried tend to be larger on regular trays. One of the most important accessories you’ll need when you’re dehydrating food is a place to store it once it’s done. The benefit of dehydrated food is how long it lasts, but you need to keep it protected from the environment in order for it to last. Containers need to be airtight so they prevent moisture from reaching the food. Standard plastic containers can work for a short period of time, but if your intention is to dehydrate food in bulk and store it for several months or seasons, you’ll want to get food storage that is specifically designed to protect dried food from moisture. This list of best food dehydrators is in no way comprehensive and there are other great products on the market—many of which are made by some of these same manufacturers. This list is a good place to begin your search for a dehydrator because it gives you an idea of what’s available to suit a variety of needs and budgets. Chances are regardless of your at-home dehydrating needs, you’ll find something you’re happy with. We believe investing in any one of these dehydrators can help you make the most of preserving perishable food and will give you an opportunity to stock up on delicious, healthy dehydrated treats.